With powerful state conservators in charge “protecting” Nancy’s “right to privacy”, the state has been successful in keeping nancy’s true story out of the news. Here are series that did run. More exposure and public awareness are needed. Note here this excellent series uses only Nancy’s first name. Why? Because by law a reporter is obligated to avoid violating a conservatee’s “rights to privacy” just as is a minor child of a parent. 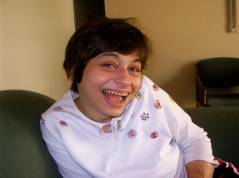 In order to obtain permission to use her whole name, Harry Martin would have had to ask the California Department of Developmental Services, who is Nancy’s conservator, for permission, and they do not want to release permission to publish an unflattering story about their care, because they have abused her and are likely to sue the paper. Most mainstream newspapers would play it safe, although they would heatedly deny it. Harry Martin got around this by not using Nancy’s full name. Thus, a conservator can even control the very First Amendment right of freedom of the press by putting constraints on release of news about someone they are abusing in state “care”. That is an obvious excess of power that must be addressed in state conservatorship reform. Isn’t it weird that after removing all the rights of a conservatee, the only right deemed important enough to leave intact to a ward of the state is supposedly his right to privacy? Isn’t it really an excuse, that we are protecting the rights of the conservators to do as they wish to their wards in private, even abusing or killing them? Letter to Editor by reader to Napa Sentinel, July 13, 2005. Ø Mr. Golin has absolutely never been “convicted of domestic violence”! This is a lie. Where does Hasan get this? Neither parent has ever been even criminally charged with domestic violence. There has in fact never been any domestic violence. Nancy has never been the object of violence, neglect or mistreatment by her parents. This is easily verified. Ø Nancy was never dressed “in tatters”, nor did she have serious body odor. She had a large and stylish collection of clothes that her mother changed several times every day. Hasan met the parents at the Metro and they were well dressed and presentable. Where did he get the evidence of this? This is Lamb again, trying to imply that Nancy is somehow a street urchin or worse. No other friends who knew the family would in any way confirm this false allegation. Hasan’s reporting is lazy and unprofessional. Ø The parents did not run around “filthy”, and suggests they are “not the cleanest people”. They were not filthy or unclean, only to one of those people who showers several times a day. Although they did work as licensed sign contractors and get their hands and clothes dirty from time to time, in good honest hard work. Ø Article talks about parents’ “poverty”, again trying to make them sound like “street people” (Lamb’s favorite term for the Golins) implying that the parents had no way to support and care for Nancy. In fact parents had a family run independent lighting and neon sign contracting business that they had founded, built, owned and operated since 1990, which in good times brought in a good amount of cash each month for their support, and in addition, Mrs. Golin had just come into a small inheritance from her father in 2000 that tragically had to be dissipated in legal costs and survival. She had just gotten a loan commitment to buy a house and they had just purchased a nice van on their credit and had just rented two new industrial workspaces with working production equipment and a long list of well-established regular customers and ads in the Yellow Pages. The City cops thought it was necessary to shut down their shops in order to stop them from having the resources to fight. Where was the poverty? Ø The injury that Hasan refers to, i.e., the burn accident, was a tragic accidental injury that Nancy mistakenly did to herself that could have happened to anyone, that we worked diligently to prevent and treat and which happened through no fault of our own, not injuries that were irresponsibly inflicted on her by others, broken bones and neurological and gastroesophageal damage through drugging and denying her treatment such as those that the State is inflicting on her through neglect and indifference now. The way the article is written it makes it look like we were responsible. No one has ever fairly insinuated that these were caused by us. All across America, parents send their children to football practice, or gymnastics, and occasionally some of them are injured. Parents take risks with their children in order to let them have fuller lives, and there are inevitable accidents. The burn center where Nancy was treated had people from all walks of life, firemen, children, seniors. Furthermore, the accident happened in 1995, practically seven years before Nancy was removed from her family, during which time there were no accidents and Nancy was healthy and safe. The risk factors were entirely mitigated afterwards. Nancy cannot distinguish situations that are unsafe from those that are safe. It is not reasonable that Nancy’s removal from her family and conservatorship proceeding was triggered because of a burn accident that happened seven years before. Ø The article implies that the parents are criminals, and refers to Mr. Golin’s criminal record. In this subtext it misleadingly suggests that this might have something to do with Nancy. Then it states that he’s “closer to the truth when he says it isn’t as bad as it sounds”, so why mention it? Mr. Golin has no unusual criminal record to make note of in the newspapers. One for driving with a suspended license, for unpaid tickets. One for “resisting arrest” because he became angry and verbal with a police officer at a traffic stop. A couple of inadvertently bounced checks. And one, in 1981, 25 years ago, the first ever in his life at age 40, for a false charge of assault, a misdemeanor, against a deranged storage yardman (Curry) who he encountered that in fact assaulted him not the reverse; Curry later ended up murdering 5 of his own friends, as reported in the Mercury News. In fact, Curry almost killed Golin during the altercation. The police, who did not witness the event, in confusion arrested Golin; Curry had friends to vouch for him. Mr. Golin it turns out was very lucky one of them wasn’t him. Golin was unable to get his charge reversed by then. Mr. Golin has been gainfully employed all his life, except for layoffs. Mrs. Golin has no convictions of any kind! This is hardly a life of crime, spread over a 65 year lifespan! It is totally irrelevant. Out of context it becomes almost criminally libelous. Ø It states that the Golins were “never the perfect couple”. Who’s perfect? Golins’ marriage has somehow weathered the storms of 43 years. The average marriage these days according to statistics is 4 years. It used to be 8 years. Ø It claims that the parents were embroiled in mudslinging against the state over Nancy’s custody. They slung mud at us, we only defended ourselves with the truth. Ø Nancy never “cut down the Venetian blinds in the shop when the parents napped”. Where did this tale come from? Since we are the only ones that would have had any personal knowledge of this, how did he verify this? Certainly not with us. Ø States that “both have health problems”, like what? For 65 year olds they are still fairly healthy and strong. It makes it sound like we are invalids or have some fatal illness, or something close to that. There are no problems that are not being managed quite well. Irrelevant. Ø Nancy is not seeking to “find her home”. 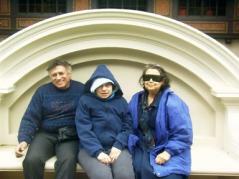 Nancy has a home, with her parents, that she desperately longs to go back to. This is Miss Lamb’s slant on the story. Ø We suspect very strongly from the particular spin that this story was actually drafted by disgruntled jealous Miss Lamb (see profile), Hasan’s only outside source, and Hasan lazily went along with letting her draft it. A year before this article appeared, Ms. Lamb confided privately to Mr. Golin that she had a great story idea for this case, which she called “Saving Nancy”. “Remember the movie, ‘Saving Private Ryan’”? she told us? “It would be a take off on that movie title!” We had no idea that she meant to slam us behind our backs at the time. Lamb’s idea of “saving Nancy” is to keep Nancy bottled up in institutional care where she is being raped and terribly abused, and then lamely complain in “Forgotten Care” the system she was instrumental in putting her into is not working. Nancy does not want to be “saved” from her loving family by Miss Lamb. She wants to be free. That is why we called this site “Free Nancy Golin”. Lamb is incompetent as an advocate and protector, never having had any children of her own, and now she is persisting in making Nancy her private hobby while she is slowly killing her with indifferent and cut-rate medical care. This spins the focus of the story from an innocent helpless kid being beaten up by state bullies with no one protecting her as reported by Martin’s articles, to whether or not the Golins are “cool” or popular, profiling them as maybe hippies or mentally ill and therefore not worthy of being heard. Hasan lied to his editors, denying making his firm promise to show the article to the Golins for fact checking before printing it as a condition of the interview, and turned it around trying to make the parents out as liars for saying that he did make that promise, which he did. Both parents were present at the Metro in the meeting room when Hasan agreed to that condition, and clearly heard his promise: “No problem, I understand completely”, he told them at the end of the interview that the Golins sought him out for. The reason that Hasan lied in his teeth going back on his promise to show the Golins his story before printing it, saying this proved the Golins were liars about his making that promise (“no professional reporter would ever promise such a thing,” he said reminding them of the number of years of reporting experience he had, averring that he had never made such a promise in his entire career, thus supposedly “proving” that the Golins lacked credibility), had to be because it would be instantly recognized in it’s draft stage to the Golins as another of Lamb’s deranged secretive slander attacks. Ø San Andreas Regional Center (SARC) is never mentioned and is given a free pass here, even though they gave these orders to her home aides to deny emergency care! Ø The article is slanted to support Agnews State Hospital (Santa Clara) psych tech union’s political agenda advocating to keep Agnews open in spite of Supreme Court mandates, on the lame excuse that the care at these integrated settings is inadequate, where in fact both of these home operators Mantilla (Embee) and Talla are also direct employees of Agnews as psych techs on the side – the article is featured on the Agnews psych techs union’s web page! The state admitted in Capitol People’s First v. DDS that it prefers to commit their “clients” to a state hospital because their legal liability is reduced there where the state is subjected to less oversight! Ø Many parents groups support keeping Agnews open because their relatives are medically fragile and cannot be cared for at home, since many of these parents are now in their 80’s and cannot manage to care for them at home and do not want to undertake the burden. But, they should not be placed at Agnews or in the community care system. We support families that want to keep their relatives in the community care system, but where a family such as Nancy’s is able to and has demonstrated that they can they should be allowed to be at home in the community at large. Ø Here Hasan relies on only one highly questionable source Miss Lamb. Miss Lamb claims undue credit for trying to correct abuses that she personally knew of in the past that are ongoing now, without embarrassing her true mentors whom she conspired with at SARC who were and still are responsible for them. Ø This article shows terrible abuses of Nancy in state care by her caregivers and regional center officials reaching lifethreatening proportions, just disclosed. Nancy’s aide [unnamed] Lynne Gelle was denied permission by [unnamed] San Andreas Regional Center acting conservator Tucker Liske to take Nancy to an emergency room for urgent medical care in 2002 when she was in the throes of twelve seizures and turning blue about to die, because Liske did not want her seizures known. Tucker Liske and Mimi Kinderlehrer of SARC do not want it disclosed that her seizures are not under control because that is the same thing they pilloried her parents for supposedly failing to do. They stubbornly claim to the probate court that now her care is being managed properly, supposedly in contrast to her parents. To cover up the truth and avoid embarrassing revelations they are even willing to let her die. 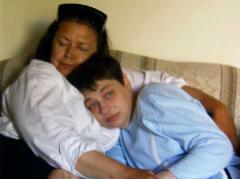 Ø It shows that Nancy was locked in a room most of the time at Embee with carpeting soaked with urine due to loss of bladder control during uncontrolled seizures, and the aides were not even informed by doctors of this cause, exactly when probate investigator Cynthia Terra inspected these conditions and included these conditions in her report to the probate court in May 2002, saying that everything was fine recommending the state as conservator, and refused to reinvestigate when the parents applied and objected. Again covering up the embarrassing fact that Nancy’s seizures in state care were not under control, the very thing the parents were pilloried for supposedly not doing. Strangely, the parents were originally falsely accused by the state of doing the very same things the state was in fact shown to have done itself! Ø Note that we parents are never mentioned in this story, as if we were dead or had abandoned her, or that we do not exist. This is bizarre. We were not contacted about this article or consulted for fact checking. We only discovered it six weeks after it was published, on the Internet. Ø As a result of Miss Lamb’s implied confessions in this article Jeffrey Golin filed a formal complaint to the Santa Clara County DA’s office for prosecution for obstruction of justice and failure to report abuse by Miss Lamb. 1/27/06: Thanks very much to Keith Hearn of the California Psych Tech’s Union for his kind cooperation today in conceding in taking down this libelous Metro article from his organization’s web site after being alerted to it’s self-serving inaccuracies!